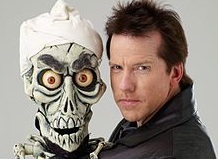 Ventriloquist and comedian Jeff Dunham is branching out from the success he has had (Dunham was the top grossing live comedy act in 2009 and 2010, according to Pollstar) with an animated feature based on one of his characters, “Achmed Saves America,” released March 18 by Comedy Central on DVD. The movie is a lighthearted and sometimes cutting or witty story built around Dunham’s Achmed the Dead Terrorist character, essentially a skeleton with a Middle Eastern accent. Like the Coneheads, he plays along with being mistaken for an exchange student from France as he finds himself in an Anytown USA that he enters wanting to destroy, in the story of the animated movie. His host family and the people of the town, along with some of the creature comforts of American life, win Achmed over, but not before he must avert a plot he already put in motion. “Achmed Saves America” is basically a sit back, relax and enjoy kind of production. It doesn’t require too much thought or alertness for subtlety. Not that there’s anything wrong with that. As a performer, Dunham is sometimes maligned by those who consider themselves more hip or cutting edge in the world of comedy, but in his stage act he does have his clever moments too, and so does this side project. Certainly, Dunham has done very well on the strength of his stage act, which has been captured in Comedy Central specials and a series that gained high ratings for the channel. “Achmed Saves America” has a reason for being in that it allows Dunham (who voices characters in the film) to open up a world for his characters that can’t be depicted using just a ventriloquist’s dummy.